I recently had the opportunity to accompany Kris Schantz, a biologist with the NJ Endangered and Nongame Species Program, to search for timber rattlesnakes (and northern copperheads) emerging from their dens in northern New Jersey. Many New Jersey residents are surprised to learn that we have venomous snakes within our state, the most densely populated state in the U.S. We have two venomous species, in fact. Be aware while driving this summer! Roads are a necessary component to human survival. Since New Jersey is such a densely populated state we have a lot of them. Many of them have a negative effect on wildlife. One of these impacts is how they block or impede the natural migration of amphibians and reptiles as they search for mates or expand their territories. During the summer I am always a little more aware while driving. In the next week many terrapins will begin to emerge from coastal waters to find nest sites. 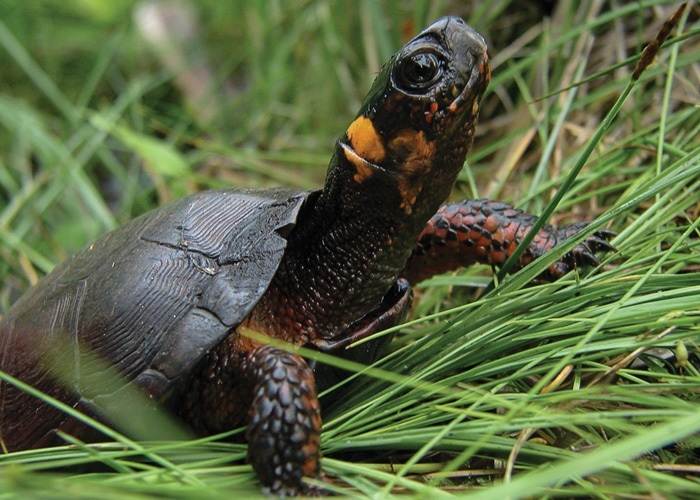 Box turtles and other freshwater turtles are seeking mates and nest sites. 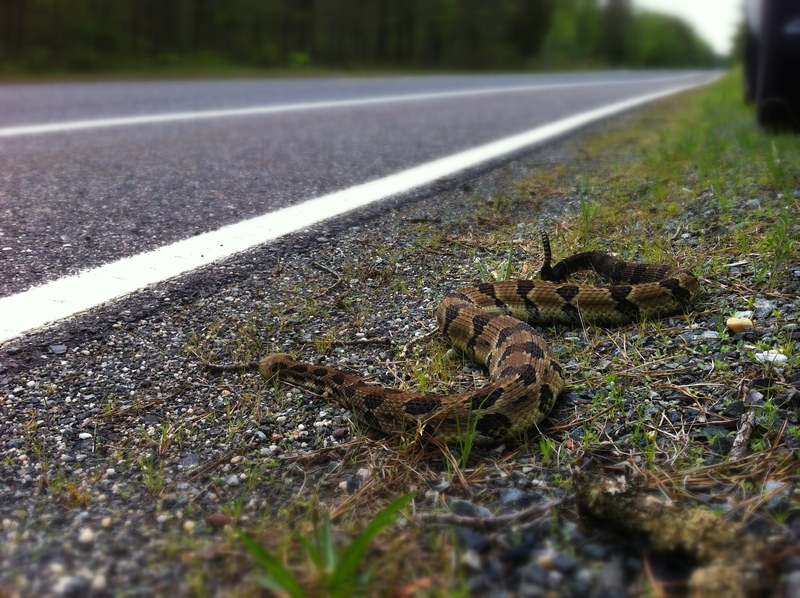 Snakes often bask in roadways to help them thermoregulate. Last week while I was driving down one road in the Pinelands I saw two cars pass me in the opposite lane. After they sped by, on the shoulder, I noticed something odd but I knew exactly what it was. A tail was flinging crazily in the air. I thought it was a snake but was’t 100% sure so I stopped and turned around to check it out. It turns out it was a snake and it was an endangered timber rattlesnake. This is only the second timber rattler that I’ve ever seen in the wild and they are quite a rare occurrence. It was still alive but severely injured. I pulled it off the road before another car hit it. I called Dave Golden a zoologist with NJ Fish & Wildlife and took the snake home with hopes that it would survive long enough to be transferred to the Cape May County Zoo. Unfortunately, it died an hour after I got home. As you travel our many roads this summer please be aware of your surroundings and watch out for any snakes or turtles that enter the roadway. Timber rattlesnakes are a very docile snake, however they are still venomous and you can die if bitten. If you encounter a rattlesnake do not attempt to pick it up!!! I was extremely cautious of this snake even though it was injured. 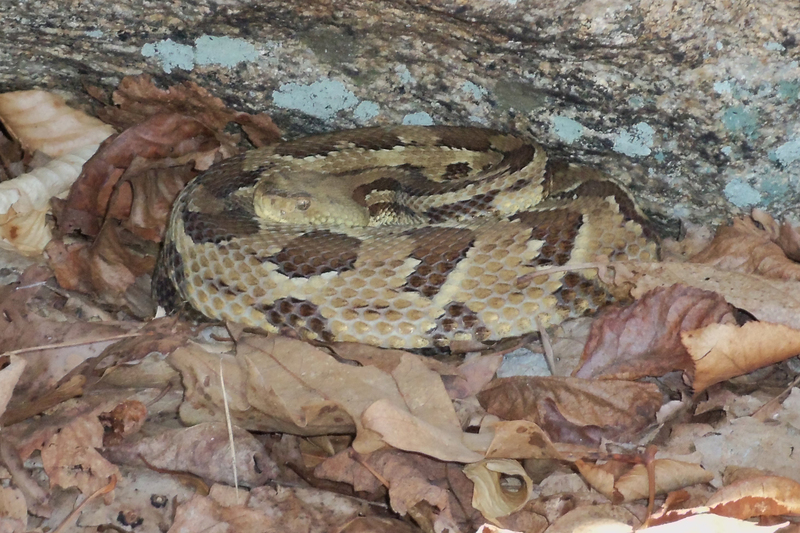 Please call 1-877-WARN-DEP immediately if you encounter a timber rattlesnake that is near your home and/or if you or it are in any kind of danger. Record information about your sighting and report it to the Endangered & Nongame Species Program here. The image in this blog is available for other organizations to use under the Creative Commons license with proper attribution. Click here to view and download on Flickr.